Billabong is my favorite brand. Forget the clothing for a minute (and only a minute), I'm talking about their marketing, mission, and message. I love looking at everything they make from their ads to their videos to their Pinterest boards, for crying out loud. If we're talking purely about brand, and putting Billabong on the same platform as every other company in every other industry out there, Billabong wins my loyalty and admiration simply because everything they do or sponsor inspires me and makes me smile. As I mentioned, this past Sunday I had my first surf lesson. Now, I don't know how to swim, like at all, so that has been problematic given that surfing has been a lifelong dream and obsession of mine. And since it was more or less an impromptu session, and because I don't swim and have only lived in San Diego for 3 years, I did not come prepared with a wetsuit. This is mostly because I have never owned a wetsuit. Earlier this year, when Billabong came out with their Surf Capsule wetsuit collection, I thought the designs were so adorable and I wished I had a reason to buy them. Seriously, how cute does Ellie Jean Coffey look in this video sporting the Peeky Wetsuit Jacket in Seafoam? Anyway, I certainly found a reason to buy a wetsuit on Sunday when, over the course of wearing Ryan's large men-shaped wetsuit jacket, I struggled with constantly losing my bikini bottoms and having the jacket roll up and/or fill with water. I took the plunge and decided to buy two wetsuits from the Surf Capsule collection, the Peeky Jacket Ellie's wearing above and the Cheeky Jane Spring Wetsuit in Moss. 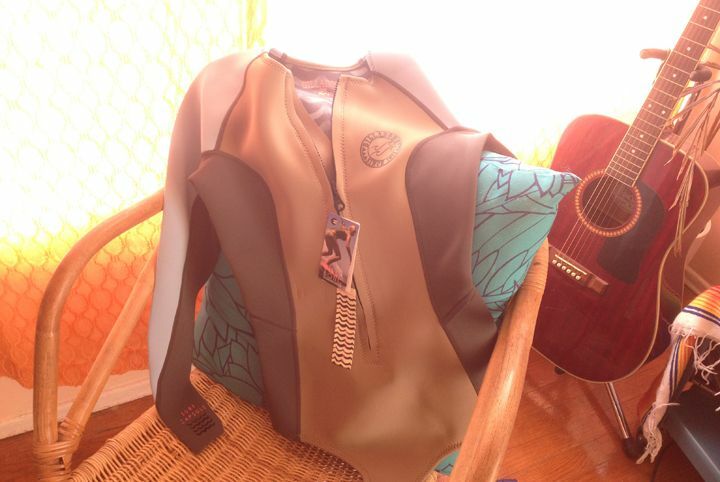 I can't believe I have my first wetsuit(s) and I'm so excited to get back in the ocean! !